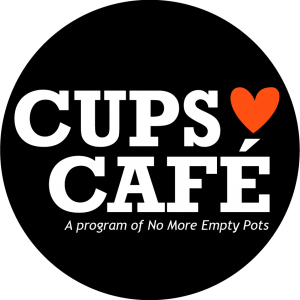 The cafe is a program of No More Empty Pots, a non-profit that strives to develop strong, food-secure communities. Cups Café serves specialty coffee, local and seasonal food, along with a meeting space available by reservation. It is a neighborhood café committed to helping the community become self-sufficient and food secure. We believe your time and money should make a difference in your community. You should have it all – great coffee, delicious food, and a mission to support. Cups Café, hold the community in your hands. The Community Room at CO2, just across the hallway from Cups Café at Little Italy, is a welcoming and inclusive community meeting space equipped with wi-fi and catering upon request. As part of the CO2 building, the Community Room is LEED Certified, offering a comfortable, energy saving and environmentally sustainable atmosphere. Maximum capacity is 20 and includes kitchenette. Catering upon request.